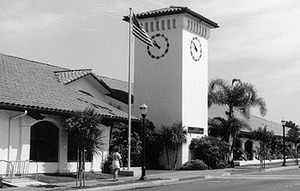 The Library’s clocktower is a landmark on Avenida Del Mar.My family owns so many gadgets, sometimes I have a hard time telling whether I live in a home or a Best Buy showroom. Through the miracle of modern marketing we have been convinced that we need all these gadgets in order to survive in the 21st century. How many times do you hear people ask “how did we ever live without cell phones?” What would we possibly do if we couldn’t reach our husbands at a moment’s notice to remind him to stop and pick up some necessary item on his way home from work? How did our parents drive more than five miles with their kids in the car without having them electronically wired to a game or a video? What did teens do with their brains before they became permanently hard wired to an iPod? Computers, cell phones, TV’s, MP3’s, DVD’s, VCR’s … the list goes on. Does anyone today do anything as archaic as to go to the public library and check out a book to read? You might be surprised. In today’s computerized, connected, hard-wired world the public library is not only surviving, but thriving. Today’s library offers much more than just the latest best sellers and musty old research materials. A great selection of movies, music, books on tape, magazines, newspapers, online access and a professional staff make the public library a one stop shop for both information and entertainment. If you haven’t been to the San Clemente Branch of the Orange County Library in quite a while, you would probably be very surprised at what you’d find there. The first and most obvious addition is a bank of nine computers right in the middle of the room. These very popular Public Access Internet Terminals are available to anyone with a library card. Students working on homework projects, visitors checking their e-mails and professionals doing on-line research all have access to one hour a day on the Internet at no charge. This service has quickly become one of the library’s most popular and the waits can be long. But the good news is you’re at the library anyway, so there are plenty of other things to keep you occupied while you wait. You can always read one of the eight different newspapers available, or one of the 200 or so magazines on display. Maybe you want to spend your time memorizing one of numerous telephone books, or researching local laws in thousands of government documents. Or you could actually read a book. They’ve got plenty of those. Of course a library would have books, but did you know you are also able to use your library card to check out movies on both DVD and VHS at no extra charge. With a selection that ranges from “Breakfast at Tiffany’s” to “Bring it On,” the library offers movies to suit everyone’s taste. On a recent afternoon Senior Librarian Maureen Gebelein assisted a patron in locating “Once Upon A Potty...for Girls” (a very popular title!) and a biographical book about Woodrow Wilson. Something for everyone! Nine computer terminals, 8 newspapers and 200 Music on tape and disc is also available in equally eclectic genres ranging from classical pieces directed by Leonard Bernstein to a selection of the most popular hits of 1979. Not to forget the little ones, there are also popular children’s movies and music available too. Another popular item for kids are “Book Bags,” packaged selections of storybooks with taped recordings of the book. Very convenient when you have a little one requesting “read it to me one more time!” And recordings of book aren’t just for the kids. Listening to a book on tape or disc has become almost as common as reading one. San Clemente Public Library provides many popular books on either tape or DVD, and they’re all free! Modern technology has helped the public library become more user-friendly than ever. Today you can use your home computer to place a book on hold, renew a book before it becomes overdue and search the catalogue files for books anywhere in the county system. Services like “Ask Now” provide immediate Internet access to a librarian 24 hours a day seven days a week. These librarians are there to provide immediate and reliable information about almost any topic. Access to this site provides you with a live human being who will answer your questions and guide you to Internet sites that are pertinent to your topic. It’s a lot like having a living Google search engine, someone who can help you weed out all the useless information and zero in on exactly the information you are looking for. We living in San Clemente are lucky to have one perk that no other city can claim and that is the special collection housed at the Casa Romantica. This collection of books on topics related to the history and growth of Southern California, and San Clemente in particular, is housed in a building like no other. The books in this collection are not for check out but may be accessed on Tuesdays, Wednesdays and Thursdays from 1 to 4 pm, and every other Saturday by appointment. Titles in the collection focus on such varied topics as the history of surfing, native plants and the town itself. Ole Hanson knew what he was doing when he chose to build his own home on this particular spot and you can safely say there is no more beautiful place to sit and read a library book than on this lot overlooking the beautiful beaches of San Clemente. The public library works in conjunction with the Casa to provide literary events for both adults and children including the recent Steinbeck related programs designed to enhance the Casa’s photography exhibit. Even as the library continues to keep pace with modern technology they have not lost site of their traditional role of providing reading material for both research and pleasure. And there are still plenty of people who think that is an important role.